Food scholars date the dear old fruit cake all the way back to ancient Egypt. It seems to be one of the many things required to ease your journey through the afterlife. I hope everyone reading this is having a happy holiday season. It's raining right now, which means we missed having a white Christmas by about 16 degrees. Hey! I made 5 fruitcakes this year for the holidays. Be nice! 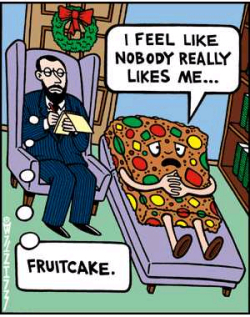 I'm sure your fruitcakes were the exception. Good to see you today!